Trunnion-mounted mills rely on castings either in grey iron for older mills, steel castings and more commonly SG iron (ductile iron) castings. US mill vendors complain bitterly about consultants employed by the Owner for the purpose of checking the quality of these castings. In fact, Svalbonas has written several papers on it [1, 2, 3]. Basically, his point is summarised in  as “[m]ining customers have never properly evaluated their structural consultants. Being an expert theoretical analyst does not automatically qualify one for QC of castings”. Well, better to be an expert at something we suppose. In any case, let us look at a few examples of castings and QC. These examples were all from the final inspection stage for owner acceptance and not part way through the finishing process. 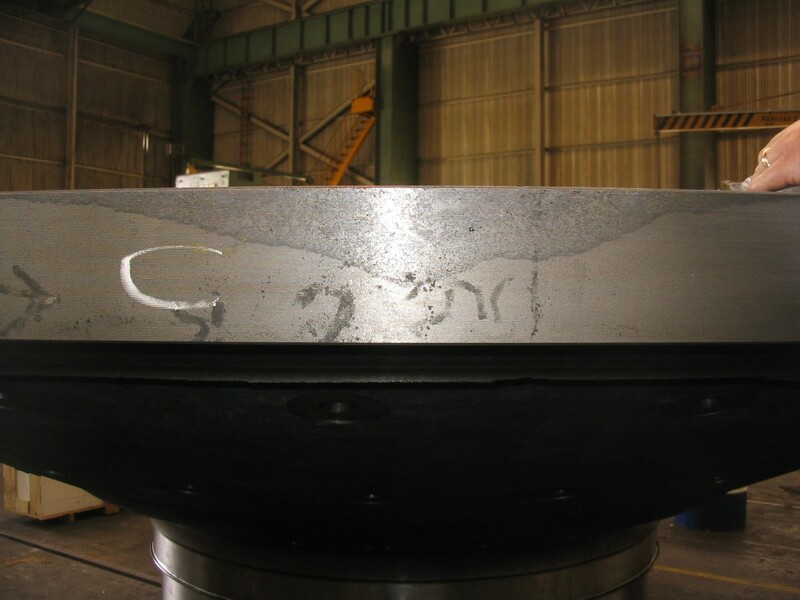 Example 1: Below is a video of a SAG mill casting that was offered for inspection after machining was completed. Click on the video and note that this was typical of the castings (23 in all) supplied for two SAG mills on a specific project. Example 2: Below is a photo of one of the casting segments from the same foundry for the same mill. Again, the casting was offered for owner final inspection after machining was completed. The repair to the gaping hole in the flange was instigated by the owner, not the vendor. If pinholes can reduce the fatigue strength by 40% , this region in its original state would have reduced the fatigue strength and hence the life of the casting by much more. 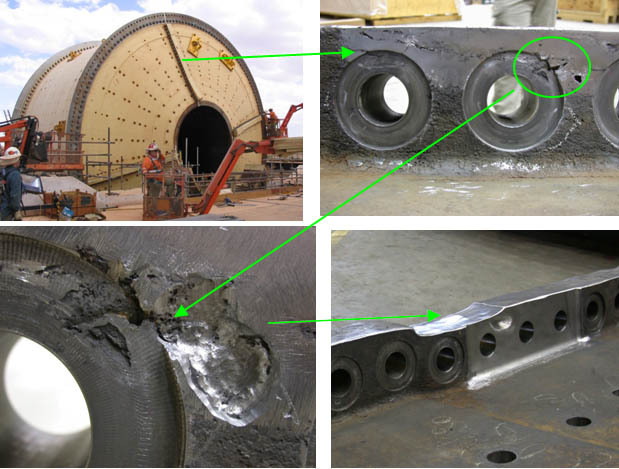 Figure 2: Mill flange defect – offered for inspection after machining completed and ready for rubber lining. Example 3: A casting for a mill is shown in Figure 3. The casting was inverted from the position shown in Figure 3 when it was presented for final inspection. The casting was in a dark corner of the factory and the flange was on blocks just high enough to enable someone to see the surface of the mating section of the flange. When the poor surface finish was detected, the owner insisted that the casting be flipped over for a better inspection the following day. Dark areas that were clearly dross were found in the casting flange once it was cleaned up. The vendor’s representative said that the dark areas were not an issue as they were just “oil stains” on the metal. It was necessary to hire an independent UT technician to prove that the dark areas were dross and not just a surface blemish as the vendor insisted. The dross extended for much of the flange circumference. Figure 3: Mill flange defect – offered for inspection after machining completed and ready for rubber lining. It is clear from these examples that not much experience in QC is required at all to detect significant flaws in castings. The concern here is that in these cases and in many others, it was the owner’s consultants who found the faults, not the vendor’s inspectors. In light of these examples, consider then Svalbonas’ complaint that owner’s structural consultants are not automatically expert in QC. Whilst Svalbonas’ complaint is factual, i.e., structural expertise does not necessarily confer QC expertise, it is evident that almost any mechanical or structural consultant worth his salt would have been able to find these defects. So, there are plenty of examples of substandard components offered by vendors to owners for acceptance and many times, the owner will not only find a fault but they will save their bacon and the vendor’s bacon (in terms of warranty). Furthermore, we do not dispute that there are instances where owner’s consultants do not offer value in the evaluation process. No-one is always right, not mill vendors and not consultants but as long as vendors serve up appalling components such as those in Figures 1 to 3, there is no option for the owner but to invest in their own surveillance team. Separate subsurface flaws in close proximity will not amalgamate under the “stress levels used by Metso”. It is not necessary to remove all dross from a casting or to scrap a casting that has dross. The standard UT used to size sub-surface flaws is too conservative and there are phased-array devices available that can provide more detailed description of flaws to delineate individual pit clusters. Whilst the evaluation of sub-surface flaws is too conservative, Svalbonas does not provide an alternative. We suspect that his idea is not to evaluate sub-surface flaws at all, but it is unlikely that owners would accept this without an independent study being done. Whilst Metso apparently has done some testing, the data has plenty of holes in it. A further difficulty is that Metso, FLS and Outotec evaluate flaws differently from one another. The “potato” shape described in  is not smoothed by other mill vendors; the complete stress range is considered by some vendors and not others; and stress intensity thresholds used by the various vendors to assess flaws vary by up to 50%. Since there is no consensus between vendors, it is unlikely that there will be consensus on this matter between owners and vendors. We do not believe that dross is a crack as in Item 2. It is possible that a fatigue strength reduction could be appropriate but again there are problems. Noting that “dross” means “worthless or rubbish”, how can we define the properties of Svalbonas’ “mild dross” and “severe dross”? The material properties of pristine SG Iron can vary dramatically between foundries, will the properties of “mild” and “severe” dross also be different in all foundries? Can the microstructure of dross be used to determine the fatigue strength reduction factor? Can non-destructive testing methods determine what type of dross is present? We are not rubbishing Svalbonas’ argument here, these are questions that he has not answered. We agree that separate clusters of pits would not necessarily coalesce under load. However, there is no point delving into this further if there is no way of detecting these separate pit clusters. We agree again that the presence of dross should not result in automatic rejection. However, in the photos of castings with dross in , the dross is located on the end of the trunnion that fits into the head and there is very little stress there. That is why we didn’t complain about the casting when we were asked to review it by the owner. What happens though when the dross is in a highly stressed area? Is it reasonable to expect an owner to accept castings like those in Figures 1 to 3? The owners we worked for thought not. It is all good to say that there are phased array devices that can assess flaws more accurately than normal UT. However, this equipment is not offered by Metso on all casting flaw evaluations even when the casting is going to be rejected. On a recent project, the owner all but insisted that such a device be used to assess a flaw that was sufficiently large to reject a casting yet Metso would not use it and gave no reason why. Sadly, the casting was rejected. There is not much point advertising this equipment if it not available for use. The European standard on ultrasonic testing of SG iron castings, EN 12680-3: 2011, does not help here either because, for Severity Level 2 castings, dross is limited to 15% of the wall thickness and so the castings above would be rejected and the maximum size of subsurface flaws within 30 mm of the casting surface is only 1000 sq. mm (less than 2 sq. in.). Severity level 2 may be too sever though. In any case, this EN standard does not provide guidance on what to do if the flaws are larger then the specified acceptable limits. When castings are as poor as those shown in Figures 1 to 3 above, no QC qualifications are required to know that they should be not be accepted without remedial work or in some cases, rejected outright. We cannot say that no-one wants to reject a casting without good reason but we do not know of anyone who does. Instead of complaining about consultants, their qualifications and their experience, it would be more advantageous for mill vendors and the mining industry to put their hands in their pockets and fund some independent research that can be published openly and subjected to peer review. Both vendors and owners should be involved so that bias is not an issue. We agree with most of the issues raised by Svalbonas on the overly conservative nature of casting flaw evaluation but he has not presented any alternative that can be applied to castings from Metso and other vendors. However, credit must be given to Svalbonas as it is clear that he has done a lot of research. There is no evidence of such research being done by other trunnion-mounted mill vendors. In essence, the point of view one takes on casting flaws depends on perceived risk. At present, there is no objective consensus on the issues described in [1, 2] and discussed in the bullet points above because not enough research has been published in the open literature. Owners therefore are more conservative than vendors because the owners will face consequential damages if failure occurs whereas vendors will not. Finally, it is worth noting that it is pretty easy for any competent mechanical or structural engineer to learn all that is necessary on the QA/QC of mills castings in a relatively short time. It is not a matter of expertise in using test equipment. What is important is how the results from an inspection are used to assess the casting flaws and yet there is no consensus or uniformity in non-conformance assessment within and between vendor groups and between projects. This is not good for generating confidence in owner’s teams. Svalbonas has proposed that an international standard should be developed for mill design . This seems like a good idea that should be supported by industry. It would certainly go a long way towards stopping disputes. Svalbonas, V., et al., 2009. Mill head castings – educating opinions. SME Annual Meeting, Denver CO.
 Svalbonas, V., et al., 2006. Mill castings design – Experience vs. theory. SAG2006 Conference, Vancouver, B. C.
Svalbonas, V., et al., 2001. Fitness-for-purpose: should you buy one grinding mill for the price of two? SME Annual Meeting, Denver CO.
 Riposan, I., et. al., 2008. Surface graphite degeneration in ductile iron castings for resin molds. Tsinghua Science and Technology, v. 13, n. 2.